When planning on returning to Paris, but this time with my son, I was slightly concerned. He had been looking forward to visiting Paris ever since we’ve known each other, and I really didn’t want him to feel disappointed. I wasn’t sure the things that had made me completely enamored with the City of Light would have the same effects on my well-traveled 11-year-old. Paris with kids? Yes! You really can’t go to Paris and not visit the Eiffel Tower. It’s just one of those things you have to do. And it’s fun for kids. Bring along some 1€ coins so they can look out through the telescopes. I really enjoy watching the sunset from the top of the tower. Unfortunately, it is a bit pricey to go to the top. If you don’t feel like dropping the money on climbing the tower, it’s worth it to just make a visit and see it. If you go at night, you can enjoy a bit of a light show every hour. The Arc de Triomphe is another one of the world’s most well-known memorials. You can walk around the base of the monument for free, but you have to pay to take the stairs to the top. Frankly, I don’t think it’s worth the 8€ to do that (kids 17 and under are free, though). When visiting here, don’t try to cross the street. There are underground tunnels connecting you to the “island” that houses the monument. Notre Dame is probably not going to be too exciting for your children, unless they love the cartoon and want to see the real one. Since they’ve erected some new structures in the plaza, it isn’t a good place to come for a picnic, either. The only good reason to come avec les enfants is for the chance to feed the pigeons. It was so much fun, Tigger insisted we return again. The Louvre is another place that is probably not that exciting for children. However, the grounds and the lovely gardens next door are worth visiting. If you come at night, the famous pyramid entrance to the famed museum is lit up which is quite beautiful. One place that could be very interesting for tweens especially is the Musee de Cluny. This houses a great collection of items from medieval times. There is also a rather beautiful garden on the grounds. Adults (over 26) have to pay 8€, but everyone else is free. 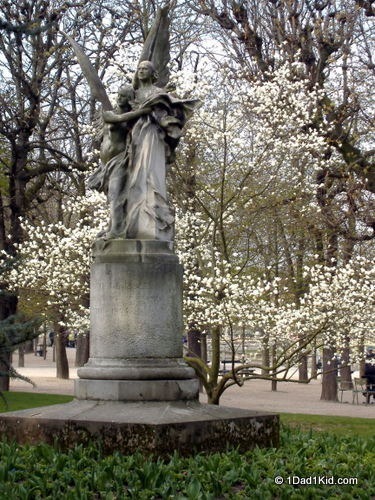 This is a great location because the Sorbonne and Latin Quarter are nearby, as are the fabulous, must-see Luxembourg Gardens. 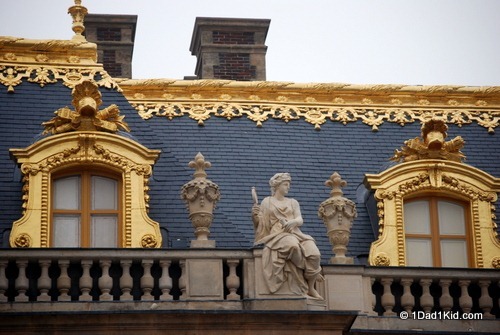 This amazing palace is outside of Paris, but it’s a short train ride to go there. If you are visiting between March and October, make sure to check their website to find out when the fountains are turned on. They do not run daily, and it’s worth timing a visit with this schedule. During the nice weather, you can rent bikes and tour the enormous estate. You can even rent boats to enjoy on the lake. The kids may not be as fascinated with the palace itself, but the grounds are wonderful, and you’ll find plenty of locals enjoying the various gardens and other areas. Ticket prices vary based on what you want to see while there. In my opinion, the Trianon palaces and Marie-Antoinette’s estate are really not worth paying more money to see. Kids under 18 are free. Adults will have to fork out 15€ for admission, though. However, between November and March, admission is free for everyone the first Sunday of each month. Also, there is a fairly long list of situations that may qualify you for free admission. I was able to use my photographer credentials to get in for free. 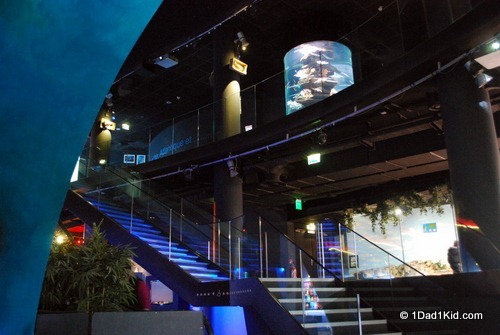 The Paris Aquarium (if walking there, follow the signs that point to the Cineaqua) is a nice little aquarium. They have a “petting area” where kids can touch the fish, anemones and starfish, etc. There are some well-designed exhibits, and there are also different movies playing in the theaters (including some in English or with English subtitles). It’s quite expensive, in my opinion, at almost 20€ for adults. In the winter, there is an outdoor rink at the city hall building (Hôtel de Ville). Skating is free, and there is a fairly nominal charge to rent skates. You will be required to have gloves and a jacket, though. The security guards even double check your hands to make sure you have gloves on before you head outside. It’s fun to visit this area at night, as well, as it’s all lit up. These are essentially water taxis that travel up and down the Seine and pass by all the main attractions of Paris. A pass is good for the whole day (multi-day passes are also available). They’re really great fun and often get you closer to sites than other modes of public transportation. During the warmer months, most of the big parks have carousels, trampolines, and other things to entertain the kids. The Tuileries is probably the most fun. There really are tons of fun things to do in Paris for children. Sometimes it just takes a bit more creativity to find them. 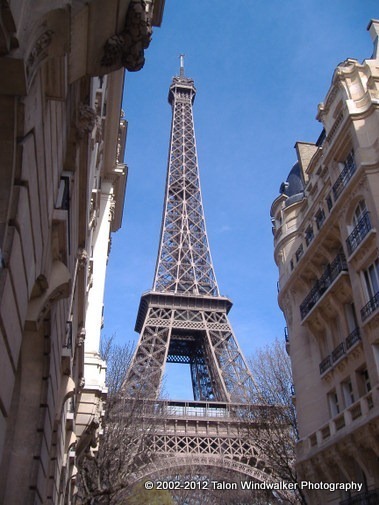 Where are your favorite places to visit when you go to Paris with kids? I went to Paris when I was a tween and this list would’ve definitely been useful back then. Thanks for sharing! In the words of Le Zac, “le steak”. Also, and I hate to say it, EuroDisney is absolutely bloody fab. I agree with Zac. LOL I was thankful Tigger had no desire to visit EuroDisney, although I will say I was mildly curious. Musee du Cluny is probably my favorite museum anywhere. The combination of Medieval tapestries in a cool old building combined with a Roman bath is fantastic! Although not “tween-tested”, you might want to consider visiting Les Egouts: what kid could resist an underground romp through the sewers? 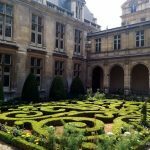 My experience of Paris as a tween involved Disneyland, then the Eiffel tower and the Sacre Coeur. Unfortunately, my mother had gallstones and didn’t make it to the top of Montmartre to see the cathedral, and ended up getting taken to hospital in an ambulance. She turned out to be fine, and despite sounding awful, it was actually quite fun for me and my 10 year old brother! Yikes! Glad it at least turned out well. Sacre Coeur is my favorite church. I’ve never been to the aquarium, way too expensive. But we love the Galerie de l’évolution and the menagerie inside the jardin des plantes (the first one is a kind of exhibition on animals, the second a small zoo with only animals under international protection). You definitely haven’t missed much. It’s a nice place to escape the cold of winter, but yes it is rather expensive. Paris was so magical for me at 15, 16 and 19…I can only imagine how the puppet shows, dogs in cafes and street clowns would be for a kiddo! I’m looking forward to going back with Tigger when it has warmer weather. It’s a different city in winter for sure. thanks for sharing. it’s a good post. 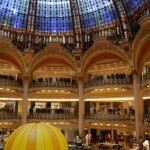 will be going to Paris soon (not with a kid though, but with my fiancee); and we’ll take your tips into consideration! March 2014–please, where can this be found? If you go to Destinations up above, choose Europe, then France, you’ll find it in there. MARTIAL ARTS demonstrations, not marital arts demonstrations…ha, ha, ha!! 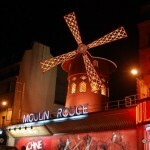 Hi Talon – this was another great post – I do love your writing and I love your posts about Paris! 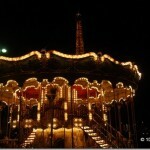 We’ve been to Paris a couple of times and my son’s most favourite places are the Eiffel Tower, the Aquarium, and the many carousels near the Tower (me too – yes, we are never too old for a carousel!). Before we went up the Tower, we created elaborate and deadly fast paper airplanes to propel off the top. My son’s plane flew the farthest – out over marital arts demonstrations, down multiple city blocks, and finally, over a far-off roof of an apartment building – amazing! However, I looked only occasionally because I am so deathly afraid of heights that the tears were streaming down my face and I thought I was going to die (especially going up in the glass elevator!). I just kept whispering “this is for you, my love” and I was able to remain up high with him…it is one of the best moments of his life! I am so happy that you are providing fantabulous moments/memories for your son and yourself! Bravo, mon ami! PS – only after the planes were long gone from our sight did we see the posted signs, warning the public not to throw anything off the tower!!! !